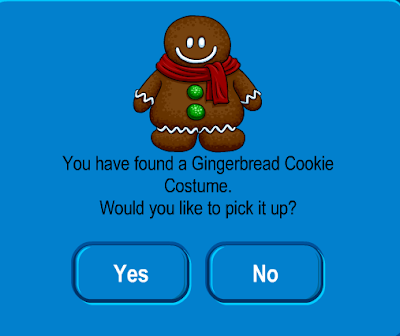 Club Penguin Cheats by Mimo777 Club Penguin Cheats by Mimo777: Club Penguin Christmas Party FREE item...Gingerbread Cookie Costume! Club Penguin Christmas Party FREE item...Gingerbread Cookie Costume! The December 25th new Club Penguin FREE item from the 12 Days of Free Gifts in the Forest is here! Woot! A Gingerbread Cookie Costume for ALL! YES!!! I was right! 25th of December will always be the BEST! santas been to my house!!!! I saw someone wearing this 2 days ago. Im so confused!! Merry Christmas everybody! Enjoy the gifts! The other club penguins cheats are so better than this. It was released today and some cheaters got it!! I read on Wiki that some people change their date and language on cp to get the gifts faster! What cheaters! Hello I Kool, the reason for your question is that that someone just changed their date and time to the date on the date of the presents they have. what I'm saying here is that anyone can change their date and time so that they can get the future presents.